Yes, you can leave the AC adapter at home. The Asus ZenBook 13 is just the ticket for productivity-minded road warriors on a budget. It weighs less than three pounds, measures a little more than a half-inch thick, and boasts a quad-core processor and all-day battery life. This particular model of the ZenBook 13 has downsides: It lacks discrete graphics for gaming, it chugs during lengthy CPU-intensive tasks, and it’s saddled with a dim, non-touch-sensitive display. Still, it shines when it comes to everyday computing chores, and its battery keeps going and going. We reviewed the version of the ZenBook 13 (UX331UA-AS51) that’s currently about $799 on Amazon. It comes with an 8th-generation quad-core Core i5-8250U processor, 8GB of low-power DDR3 RAM, a 256GB solid-state drive, a 13.3-inch full-HD display and integrated Intel 620 UHD graphics. On paper, that makes for a solid productivity-minded laptop for handling everyday tasks like web browsing, word processing, spreadsheets, light photo management, and maybe even some casual gaming. For about $100 more on AmazonRemove non-product link, you can step up to a version of the ZenBook 13 (UX331UA-DS71) with a beefier Core i7-8550U processor. A higher-end version (the UX331UN-WS51T), which we reviewed earlier this year (available on Amazon), adds discrete Nvidia GeForce MX150 graphics, good for those who want to dive into Adobe Premiere or indulge in a little Fortnite (playable at a smooth 60 fps if you settle for the “Medium” graphics preset). The Asus ZenBook 13’s “icicle white” lid doesn’t attact fingerprints the way the pricier “royal blue” model does. While its shell isn’t terribly distinctive, aside from Asus’ signature concentric circles etched into the lid, the ZenBook manages to look sleek and professional. The “icicle gold” (think silver) flavor of our ZenBook 13 review unit lacks the gorgeous glossy “royal blue” finish of the pricier discrete-graphics version; then again, it also attracts far fewer fingerprints. Open the lid and you’ll find a slim 6.86mm bezel around the 13.3-inch display, while the icicle gold finish covers the entire palm rest. The Asus ZenBook 13 UX331UA’s 13.3-inch, 1920x1080 screens looks as sharp and colorful as other full-HD displays we’ve seen in this price range. Viewing angles on the ZenBook’s “WideView” AHVA display panel (AHVA is Asus’s proprietary take on IPS, by the way) are also solid, with the screen dimming slightly near the 45-degree mark—again, standard stuff. The Asus ZenBook 13’s display is on the dim side (no surprise given its budget price tag), but at least the screen boasts solid viewing angles. Given the ZenBook 13’s relatively low price, though, corners had to be cut somewhere. In this case we’re talking screen brightness—just 226 nits (or candelas), somewhat short of our 250-nit standard for comfortable indoor reading. While the ZenBook’s display was relatively easy to view in my office, I found myself squinting a bit when using the laptop near a bright window. It’s also worth noting that the ZenBook 13 UX331UA lacks a key feature present in its sibling, the slightly pricier (and discrete graphics-equipped) UX331UN: a touch-sensitive display with active pen and Windows Ink support. Back on the plus side, the ZenBook 13 comes with a comfy, snappy keyboard, complete with three-step backlighting, slightly concave key caps, about 1.4mm of key travel and a nice, tactile actuation bump. Most of the standard function-enabled hotkeys are available, including airplane mode, sleep, brightness, volume, and display preferences, although media playback and settings hotkeys are missing. The Asus ZenBook 13 UX331UA’s down-firing Harman Kardon speakers are actually pretty decent for a budget laptop, with crisp, detailed sounds and a tiny bit of bass (better than nothing, which is what you usually get). The ZenBook 13’s speakers are also impressively loud, as I discovered when I cranked “Live and Let Die” by Paul McCartney and Wings. The ZenBook’s speakers are no substitute for a set of dedicated speakers, of course, and you’ll generally get better sound by plugging in a pair of headphones. That said, I’ve definitely heard worse. Meanwhile, the Asus ZenBook 13’s 480p webcam (which sits in the bezel above the display) capures blotchy, washed-out images that will disappoint all but the most indiscriminate Skype users. The Asus ZenBook 13’s collection of ports should satisfy most budget-minded users, starting on the left side with a full HDMI port, the first of two USB 3.0 ports, and a USB 3.0 Type C Gen 1 port (up to 5Gbps). Also on the left: a barrel-shaped charging port, plus a pair of indicator lights for charging and standby. 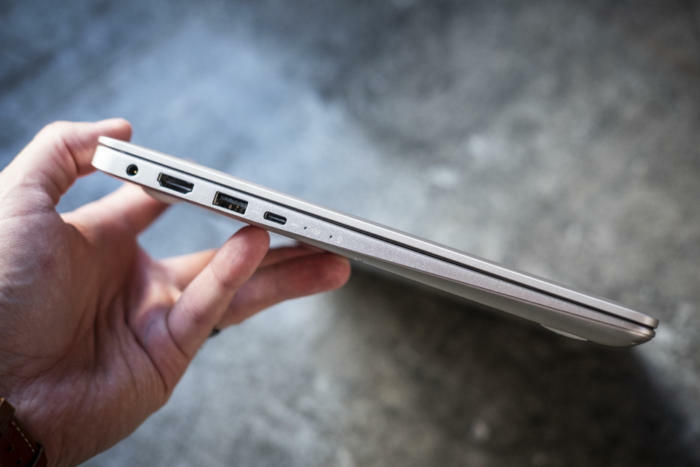 Left-side ports on the Asus ZenBook 13 include full HDMI, USB 3.0, and USB-C Gen 1. 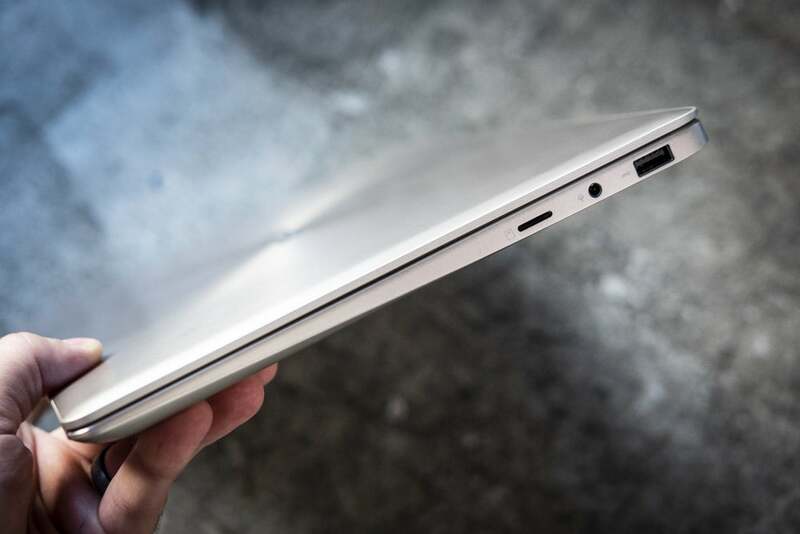 On the right side of the ZenBook 13, you’ll find a second USB 3.0 port, a combo audio jack and a micro SD card reader. No Thunderbolt 3, unfortunately, but that’s not surprising given the ZenBook’s budget price tag. The Asus ZenBook 13 comes with a second USB 3.0 port on its right side, plus a combo audio jack and a micro SD card reader. 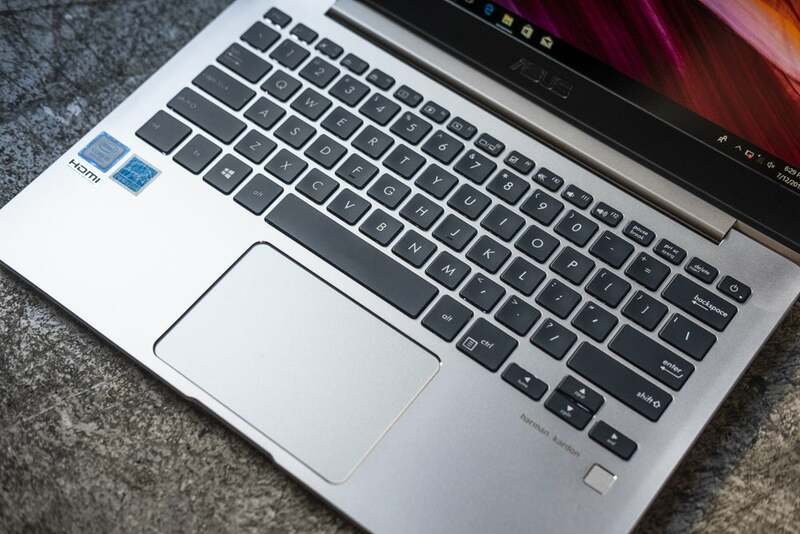 As with any budget-priced ultraportable laptop, and particularly one with an integrated graphics core, you’ll need to keep your expectations in check when evaluating the Asus ZenBook 13 UX331UA’s performance. No, the ZenBook 13 isn’t a gaming machine, nor will it rattle any bones with it comes to processor-intensive tasks like video encoding. That said, the ZenBook has solid productivity chops, and its impressive battery life only sweetened the deal. 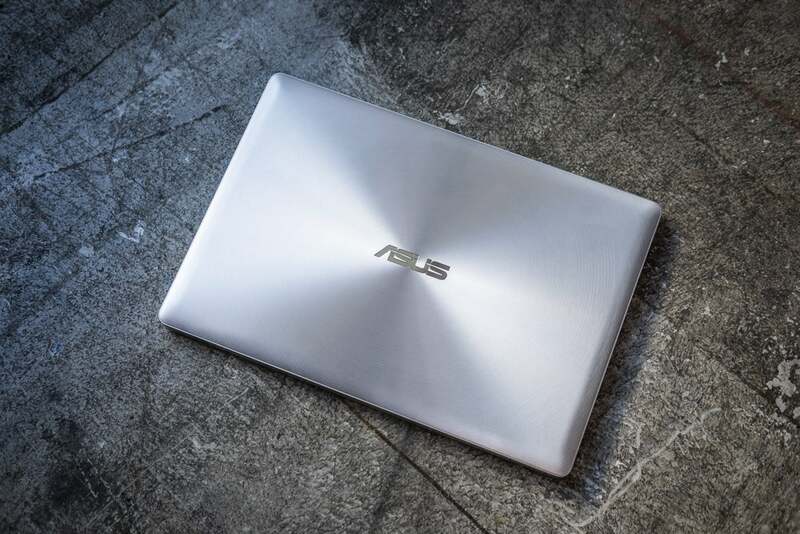 First, we wanted to confirm that the Asus ZenBook 13 can perform everyday tasks with a spring in its step. To do this, we fired up PCMark 8, a benchmark that simulates such daily computing chores as browsing the web, composing word documents, tinkering with spreadsheets and video chatting. 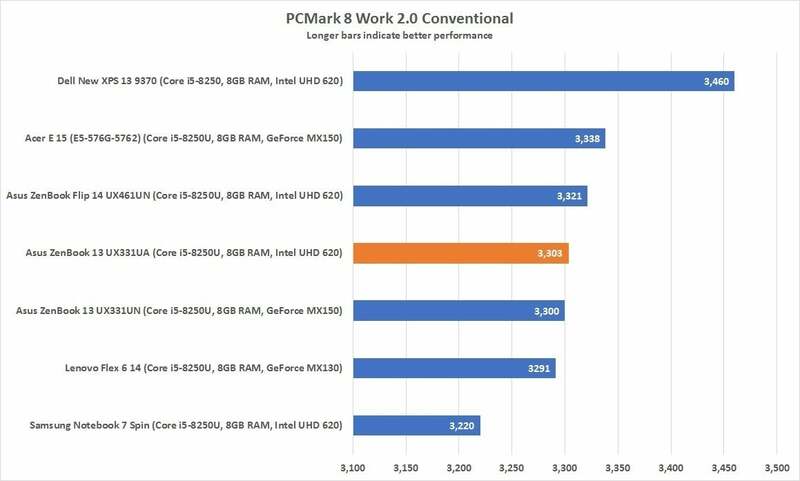 Typically, we’re looking for a minimum PCMark 8 score of 2,000, while the peppiest laptops often score 3,000 or better. You can expect smooth Office performance from the Asus ZenBook 13 given its impressive PCMark 8 score. Good news: the ZenBook 13 and its quad-core, eighth-generation CPU clears the 3,000 mark with ease, along with its similarly equipped competition. Don’t get too hung up on who got first place and who came in last. For our purposes, any score over 2,000 merits a passing grade, and quibbling over a few hundred points in the 3,000 range is just splitting hairs. Here’s where things get interesting. In our next benchmark, we use the free HandBrake tool to convert a 40GB video file into an Android tablet-compatible format. This lengthy (often an hour or more) and CPU-intensive task tells us a lot about how a given laptop manages heat buildup. 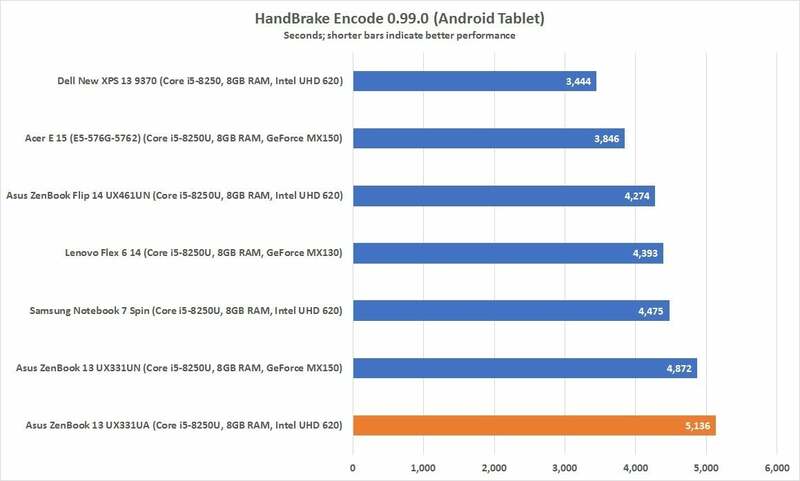 When it comes to quad-core laptops, a Handbrake score below 4,000 seconds is pretty good; 4,000 to 5,000 seconds is average, while more than 5,000 seconds is decidedly meh. Once you’re in the 6,000 range, you’re generally in the land of cheaper dual-core laptops. With its conservative approach to thermals, the Asus ZenBook 13 lags its competitors when it comes to lengthy CPU-intensive tasks. With a score of 5,136 seconds (nearly an hour and a half), the ZenBook 13 UX331UA’s Handbrake time lands it in last place, just a few minutes ahead of its pricier UX331UN sibling. It’s not an awful score, but it’s not great either. Looking under the hood, we find that the ZenBook 13 (the UA version) puts the pedal to the metal during the opening moments of the Handbrake benchmark, with its CPU package temperature soaring to 90 degrees Celsius (approaching the Core i5-8250U’s operational limits) and its processor clock speed cranking to about 2.8GHz. Within a few minutes, a combination of thermal throttling (which cuts CPU speed to deal with the heat) and power-limit throttling (which puts a lid on processor wattage output) kicks in, slamming on the brakes until CPU temperatures fall to a much cooler 60 degrees Celsius and clock speeds slow to about 1.85GHz, where they settle in for the remainder of the test. To put the ZenBook 13’s last-place Handbrake performance in perspective, consider that the first-place finish for the Dell XPS 13 comes with a hefty $1,200 price tag, while the other laptops in our comparison chart are thicker and heavier, and thus easier to cool. Indeed, the cheaper Acer Aspire E15 is nearly twice as thick and heavy as the ZenBook. Bottom line: if you were wondering how a laptop like the Asus ZenBook 13 could be so thin and light for just $799, its iffy HandBrake score tells you why. While our Handbrake benchmark measures a laptop’s performance over an hour or so, our next test is generally over in a matter of minutes. 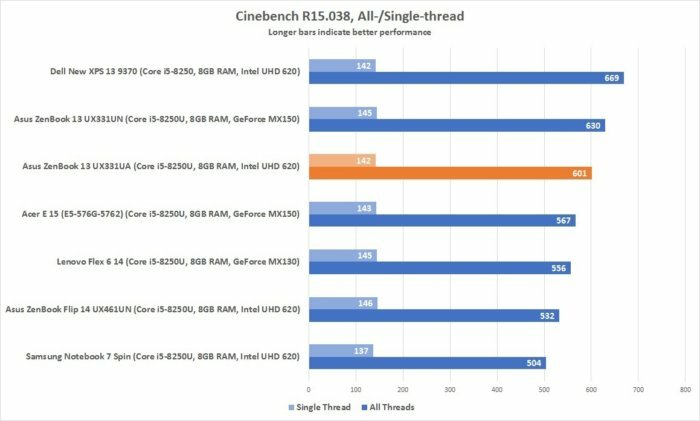 Cinebench tasks a system with rendering a 3D image in real-time, a CPU-stressing chore that spins up cooling fans just like HandBrake does, but only for a brief period of time. Short busts of intense activity are no problem for the Asus ZenBook 13, as its third-place Cinebench score attests. 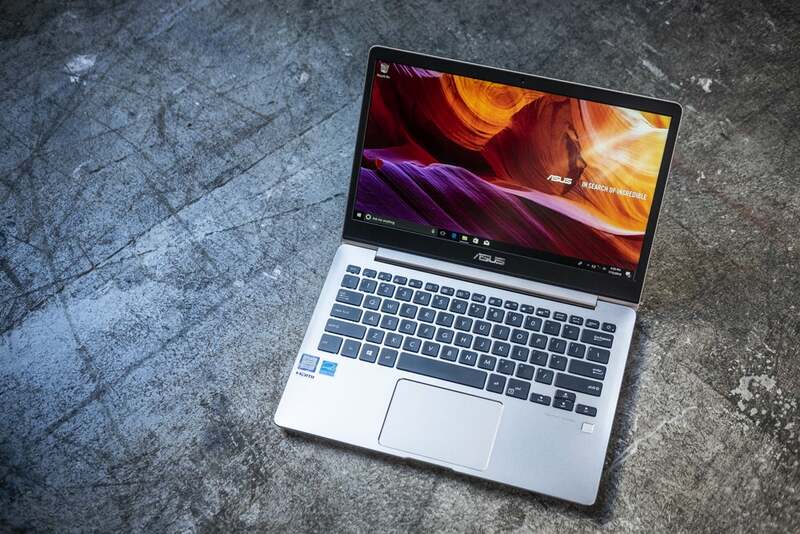 The Asus ZenBook 13 UX331UA fares much better with Cinebench, coming in third behind the much pricier Dell XPS 13 and the discrete-graphics version of the ZenBook (the UX331UN). As it turns out, Cinebench’s short run time works to the ZenBook 13’s advantage. As in the Handbrake test, the ZenBook bursts out of the gate, flooring it when it comes to CPU performance while cranking out heat in the process. By the time thermal throttling kicks in, the Cinebench test is practically over. 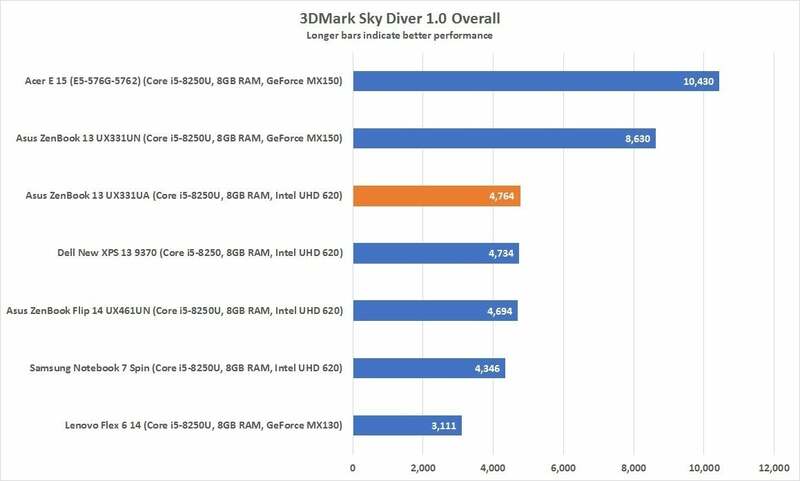 A laptop with an integrated graphics core like the Asus ZenBook 13 UX331A can’t be expected to crank out buttery frame rates when it comes to games, and our 3DMark Sky Diver benchmark confirms our expectations. Saddled with an integrated graphics core, the $799 model of the Asus ZenBook 13 can’t compete with laptops that have discrete graphics cards. Bunched up in the middle with other integrated-graphics laptops, the $799 ZenBook 13 will certainly do the trick when it comes to light photo editing, Minecraft, or casual games in general. 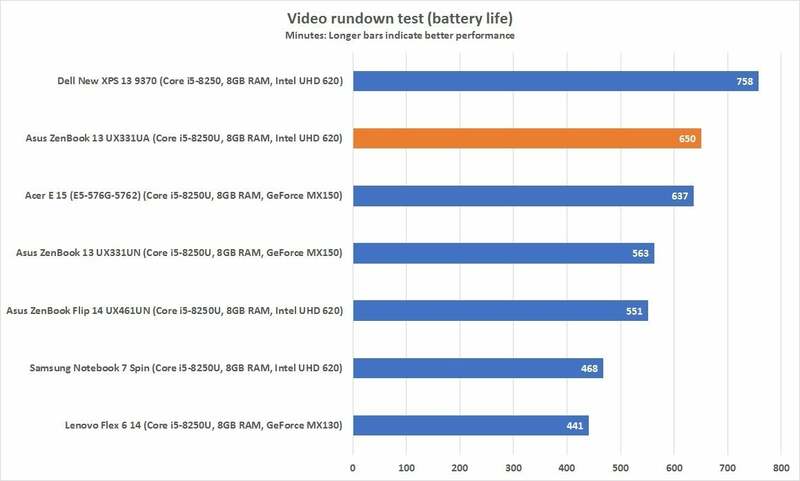 But it can’t keep up with laptops that boast discrete graphics cards, such as the Acer Aspire E15 (E5-576G-5762) and the ZenBook 13 model with Nvidia GeForce MX150 graphics. We test battery life by looping a 4K video using the stock Windows 10 video player, with screen brightness set at about 250 nits (which meant cranking the brightness all the way up on the ZenBook 13) and turning the volume up to 50 percent, headphones on. The Asus ZenBook 13 squeezes an impressive amount of juice out of its 50 watt-hour battery. The Asus ZenBook 13’s result of 650 minutes (nearly 11 hours) is impressive considering its 50 watt-hour battery, outdistancing its discrete-graphics sibling and besting the Acer Aspire E15 and its larger 62 watt-hour battery. Basically, we’re looking at all-day battery life, a great convenience if you’re working from the road.